Readers of F&C wonâ't have failed to notice that over the years there have appeared pieces produced by one of the foremost makers in the country, namely Robert Ingham. These have included furniture made for living rooms, an alter for a church and one or two boxes, the most recent being a large 275 piece jewellery box with curved exterior and interior corners, featured in F&C 152. I'd read the articles when they were published but recently I had the opportunity to see this piece and marvel at the sheer technical complexity of it, something way beyond my paltry capabilities. Occasionally though Robert drops his guard and publishes a piece that mere mortals might understand and more importantly, have a chance of producing something similar. Such a rare event happened in F&C 129 with the article on a very large jewellery chest in burr elm and bog oak. The article wasn't particularly long, but there was just enough information within to set the germ of an idea in my mind for a much smaller version, based on a similar format. 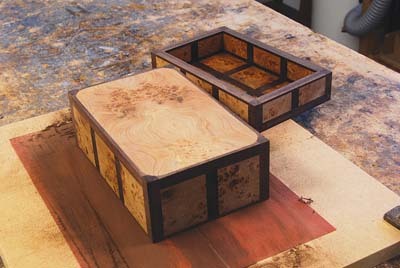 For some time, I had the idea that I'd like to try and reproduce something in Robert's style so that a box in Burr Elm (Ulmus procera) and African Ebony (Diospyros crassiflora) seemed an ideal project. 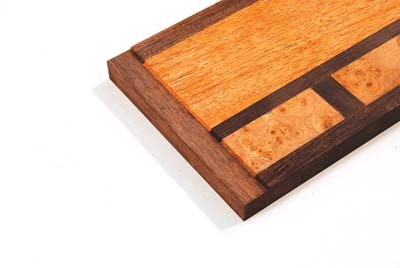 I had several email conversations with Robert on the subject and I even spoke to him personally at a recent woodworking event, where he was more than willing to offer advice and help with the project. 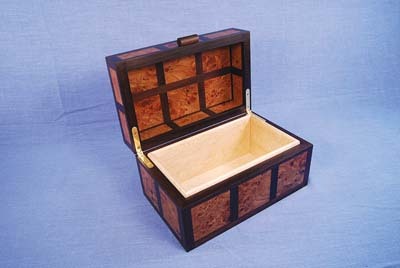 Robert's box comprised of a number of squares and a 6mm MDF core, faced with 3mm burr elm veneers each side. The matrix of squares were then gradually glued together, a row at a time, in a special jig using thin aero ply tongues for strength. 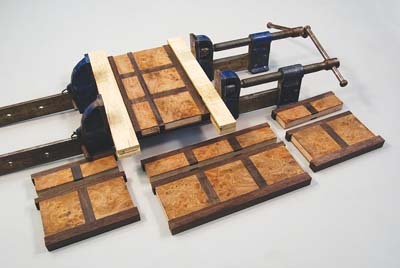 I originally decided to opt for the same method of construction, even going so far as to part build the jig. 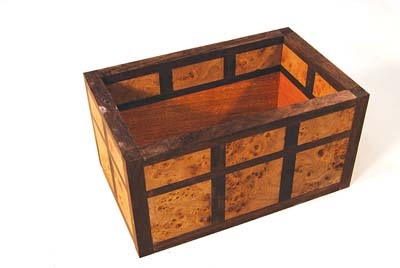 It slowly dawned on me though, that my box was small enough to allow me to make each of the sides in one piece, thus simplifying the construction process enormously. The overall thickness of the original box sides would have been 12mm and I decided to make something similar using instead a 9mm birch ply core and 2mm veneers, with a lining in bird's eye maple (Acer sachharum). I decided not to include any strengthening tongues at the corners of the box and instead rely solely on the strength of modern adhesives. My reasoning for this was threefold. Firstly, I envisaged that this sort of item would see little in the way of hard use, being mainly used as a decorative object. 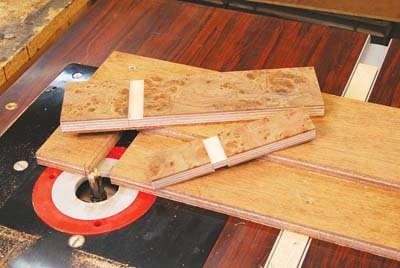 Secondly, the use of a wide rebate to hold the top and base would impart quite a lot of additional strength and finally, the birch ply would offer the element of a long grain to long grain gluing surface. This proved more than adequate, as I experienced no failures during the making process. 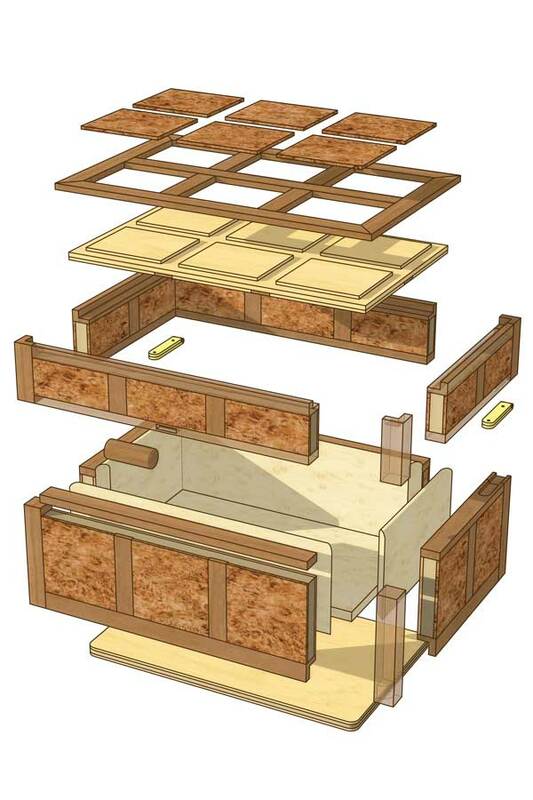 I began by preparing all the 9mm ply birch core pieces slightly oversize, after which the requisite number of elm slices were sawn, using a pair of book matched veneers for the base and birds eye maple for the interior. To save wasting burr veneer that wouldn't otherwise be seen, I used some plain mahogany as a balancing veneer for the inside of the box itself, knowing that this would eventually be covered by the lining. 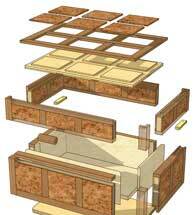 All sections were then veneered in the AirPress after which they were planed to thickness. For this part of the build, I made the other jig mentioned in Robert's article, that allowed each section to be planed to a finished thickness of 12mm. After thicknessing came a critical part, which was to dimension each section to size. 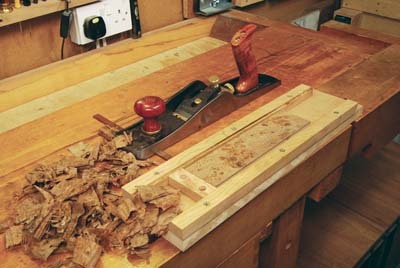 At present, I don't posses an accurate circular saw with a sliding table and fine-toothed blade, which would be the sensible way to do it so each part was planed true on the shooting board, using my LN No9. 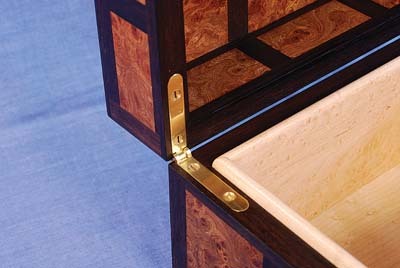 This took some considerable time, as I needed to end up with matched pairs of material for the lid and box. 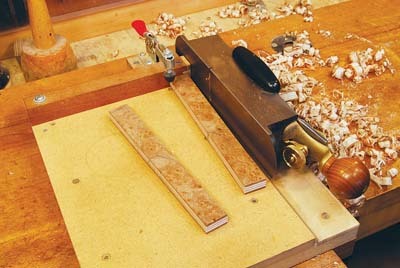 To give the illusion of solid squares I built a crude jig to use on the router table. 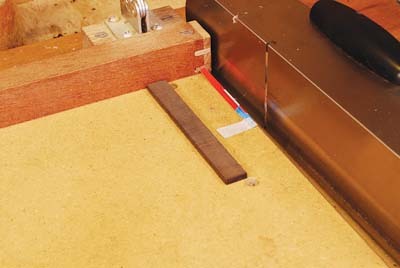 Having carefully made the first groove in each part, a small indexing strip was nailed on so that subsequent grooves were precisely the same distance apart. Strips of African ebony had been prepared slightly wider than were needed and it was simplicity itself to tape a piece of card to the shooting board so that the inlay sides were bevelled rather than square, thus ensuring a really tight fit. A dab of glue and a squish between some small cramps was enough to set each in place. When each section was glued, the ebony was cleaned up. I found that planing across the grain, even with a very finely set Veritas low angle smoother was producing some tear out and in order to prevent this from happening, I used a high angle plane with a small back bevel on the reverse side of the blade. 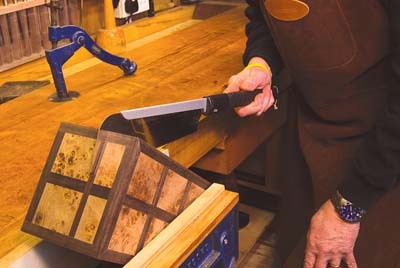 Next came a repetitive part as now the longer, thicker sections of ebony needed to be glued to each section of the lid and box in turn, after which the lid and box parts were mated together, shown in the sash cramp. Once each section had been glued, I was now left with the four main parts of the box, namely two long sides and two short sides. These were cleaned up and finally checked and adjusted to ensure that I did indeed have two matching pairs. The four vertical corner posts were then glued on after which a small 1mm rebate was machined to ensure that the ends located securely under cramping pressure and that no slippage of one part against the other could occur. 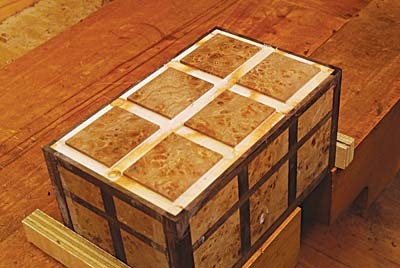 Prior to gluing, the inside faces of the lid were sanded and polished as it's impossible to do this once glued. I used a couple of coats of Osmo Polyx hardwax oil, followed by a good application of wax paste. Any project, simple or large presents the maker with a pretty fraught time and this one, even though it's quite small, was no different. I had a trial run through and having checked that it went together without mishap, the actual gluing process was straightforward. The top was then carefully fitted into a wide rebate so that it was a very snug fit. Not enough to be tight, but just enough to hold it securely in place. A rebate for the mitred lipping round the edge was then machined in situ. 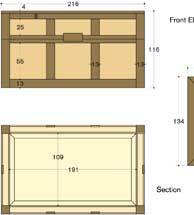 This was because the inside edge of the rebate had to line up with the box and not the edge of the ply panel. Once the outside had been machined, grooves across and along the top were made ensuring that the underside was done and at the same time. 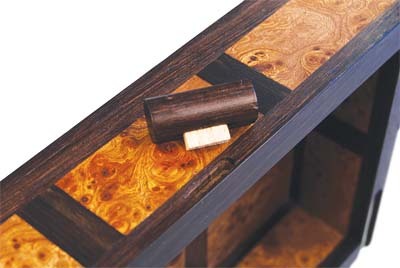 Once complete the top was left with six rectangular sections of burr elm with smaller areas that needed to be filled with ebony again, although the four outside pieces were glued and mitred one at a time at the corners. Over the years, I've made a number of boxes and there isn't any easy way to separate the lid from the box. It's got to be sawn off. 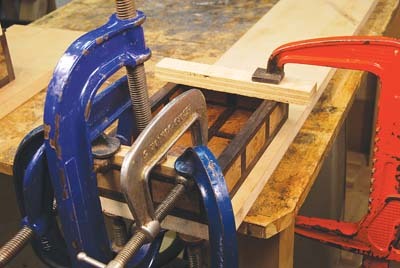 Loins have to be girded and the saw has to be applied to the line and it doesn't matter whether it's done by hand or on a well set up bandsaw. Even though my little Euro 260 would have coped with the depth of cut, I didn't trust myself and did it as I always do, by hand, this time with a Japanese saw. 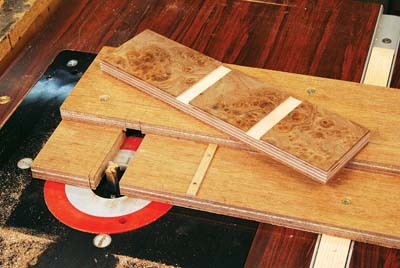 The sawn surfaces were then sanded flat using an MDF board where some 150g paper had been taped to one side and 240g on the other. 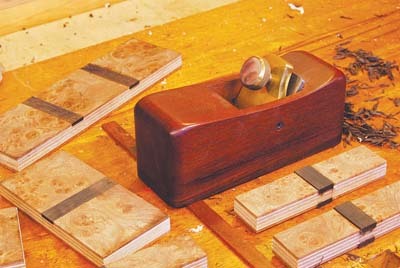 The technique is surprisingly accurate as subtle variations in hand pressure enabled both surfaces to be mated and proved far easier than using planes to do the same job. The last sections of inlay were then mitred and glued individually to the joining surfaces of the lid and box, so that after more sanding on the MDF board, each band of ebony appeared to be 12mm wide. By far the worst job is hinging the lid and box. 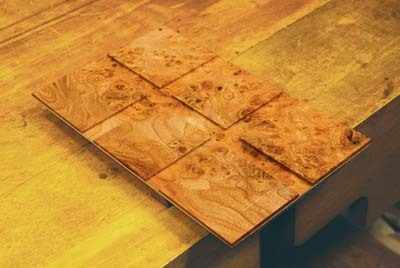 Andrew Crawford has come up with his beautifully made smartHinge, reviewed by Robert in F&C 177. Although not cheap, fitting them is child's play and what was once the most stressful part of the build has now become a walk in the park. After the hinges were fitted, the mitres at the corners were no more than a quarter of a mm out which was easy to rectify with a cabinet scraper and sandpaper. Bird's eye maple isn't a timber I usually keep in any quantity, but some time ago a pal had let me have an oddment, which proved just enough to make the lining for this box. The corners were scribed and mitred to fit and each piece was polished with several coats of blonde shellac before being glued in place. Knobs and handles are something else that often cause me problems. So often I see a wonderful piece of work spoilt by the addition of an ill chosen handle, which seems to have been added as an afterthought. The handle is usually where the person touching the piece for the first time will make contact, it's where the eye naturally gets drawn to and as such they need to be chosen with the utmost care. Fortunately in this case I decided to stick to the tradition of the original and make a small cylindrical turned knob, glued in place using a tiny fragment of oak in a 4mm groove. All outside surfaces of the box were finished using the Abranet sanding system, finishing at around 600g, after which each was given two coats of hardwax oil, a good application of teak wax applied with a grey Webrax pad and finally burnished with a soft cloth. Even though there are 94 separate pieces, I'm very happy with this little box, though what Robert Ingham may think of my effort is another matter entirely.